Keep up with Dr. Parker's latest news and notes here. Hello. 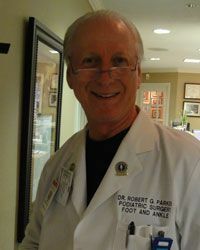 My name is Dr. Robert Parker, and I am pleased that you have found our website. Whether you are looking for a few ways to relieve foot pain that has been bothering you at home or you are looking for a Podiatrist to treat your pain, I want you to know that you have come to the right place. I have dedicated my career for over 40 years to providing my patients with the best and most up-to-date care that I can possibly provide. I served on the American Board of Podiatric Medicine as an examiner for over a decade and was one of two cofounders of The Harris County Podiatric Residency program. I was President of the SW division of the American College of Foot Surgeons as well as held the office of Vice President of the Association of Extremity Nerve Surgeons. I am honored to have the opportunity to lecture and teach cadaver courses nationally for the AENS and various State Podiatric Medical Associations on nerve surgery and various implants and fixations used in foot and ankle surgery. I enjoy that I am able to share the knowledge that I have gained throughout the years with other surgeons so that they may also provide their patients with these life changing procedures. I will belabor my credentials here; however if you care to, please click on the link to my professional profile where you will find a complete list of my experience. When I am not in the office, you will find me in the air as a pilot where I am rated for single, multiengine and instruments. In the evenings you may find me playing the guitar with my sons Sean and Cameron or enjoying a glass of wine with my wife, Pam. I want you to know that I am dedicated to your health. I am confident that you will find my office staff caring, courteous, efficient, and understanding to you and your particular needs. I look forward to working with you to get you back to living life to the fullest.